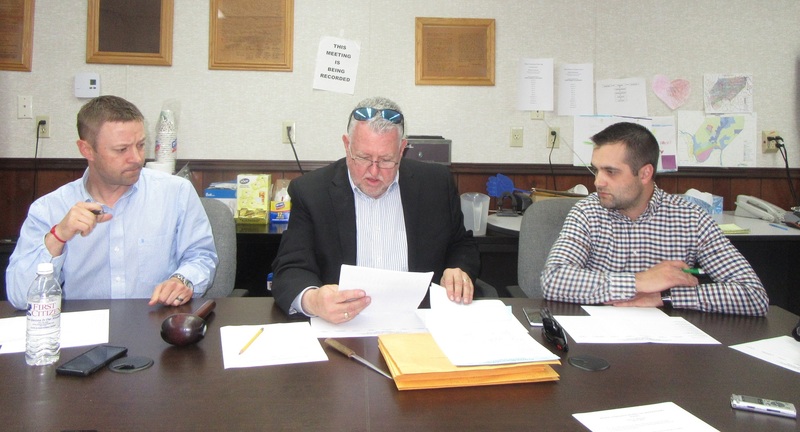 Wysox Township supervisors (above, from left) T. Thompson, Bill Them, and Evan Barnes look over eight bids received for all or parts of the project to construct a new township building on May 17. At a special public meeting on May 17, the Wysox Township supervisors expressed frustration that bids for construction of a new township building appeared to be much higher than an engineering study from the previous year had suggested the cost of a badly needed new building might be. There were also variables in the way the bids were submitted that made it difficult for the three supervisors, township engineer Eric Casanova and solicitor Jonathan Foster to make immediate comparisons. Companies expressing an interest in the project – or parts of it – included D.A. Nolt, Inc, Middendorf Contracting, Spectrum Electrical Services, and Schoonover Plumbing & Heating, most of which were represented at the meeting. The target number the township was working with was just over a half million dollars, which included engineering fees. An audience member suggested that the price of steel has risen sharply since last year and will probably only get higher. Foster recommended that the board make a motion to advertise another public meeting, which was carried unanimously and will take place on Thursday, May 31 at 4 pm. “There are a couple of possibilities,” Them suggested afterwards. “Our engineer is calling the bidders to see if their engineers have missed something. They are going to have a conversation to see if they are all on the same page. We could reject the bids and start the process over. “We have to discuss it as a board of supervisors,” Them added, noting that he did not want to speak for the other board members.